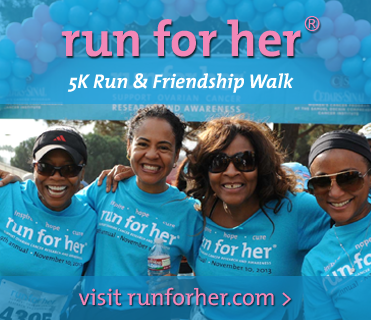 As we journey toward the 9th annual run for her on November 10, 2013, I find myself more encouraged and hopeful than ever before—and I will share why in a moment. When I started run for her 9 years ago, I had no idea if it would be a success. I just knew that ovarian cancer needed a voice. Ovarian cancer needed funding. Ovarian cancer needed a test. And ovarian cancer needed a cure. What brings me great hope is an exciting announcement from our beneficiary, the Cedars-Sinai Women’s Cancer Program (WCP) at the Samuel Oschin Comprehensive Cancer Institute. WCP has launched a program called the research for her registry, which is now actively recruiting female volunteers (ages 18 and over) with and without a history of cancer. Participants in this registry will help make a difference in the fight against women’s cancers in a non-invasive, very simple way. All they have to do in answer a secure questionnaire and their information will be entered into the research database. I think all of us want to help but don’t always know how. The registry is an easy and effective way to help save lives. What makes this even more exciting is that you can join the registry online. I just signed up, and it took less than 10 minutes from start to finish! I hope that all the women over 18 years old reading this will register and all the men reading will encourage the ladies in their life to sign up, too. For more details on research for her and to sign up, click here: www.cedars-sinai.edu/researchforher. You can also read the original announcement to the run for her community. Thank you for continuing to support our event and the work of the WCP!